Speaking at the Korean Green Architecture Forum (녹색건축 한마당) today, Ed Mazria, Founder and CEO of Architecture 2030, called for Korean building sector professionals to play a key role in tackling climate change. Mazria delivered the keynote address at the Forum sponsored by the Ministry of Land, Infrastructure and Transportation (MOLIT). Highlighting the dual challenges of urbanization and climate change, he underlined the call from the scientific community that the world must phase out all carbon dioxide emissions by mid-century in order to have a good chance of avoiding catastrophic climate change. 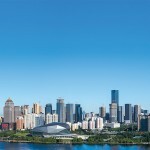 Cities account for 75% of global greenhouse gas emissions, and in Seoul, buildings are responsible for 68% of the city’s total carbon dioxide emissions. To address climate change, buildings must be part of the solution, and the latest Seoul Action Plan for the Compact of Mayors states the Seoul Metropolitan Government’s commitment to reduce emissions by 25% and 40% by 2020 and 2030 respectively with 2005 as the baseline year. The South Korean national government has set a target to have all new multifamily housing achieve zero net energy by 2025, with the Seoul Metropolitan Government going further to set 2023 as its target year. “What the Seoul government has committed to is commendable and sets an important example for other cities worldwide. Building professionals in Korea can shoulder the responsibility and use their creativity to implement these targets,” said Mazria. He also stressed that Seoul can go further and commit to a long term goal of zero CO2 building sector emissions by 2050. 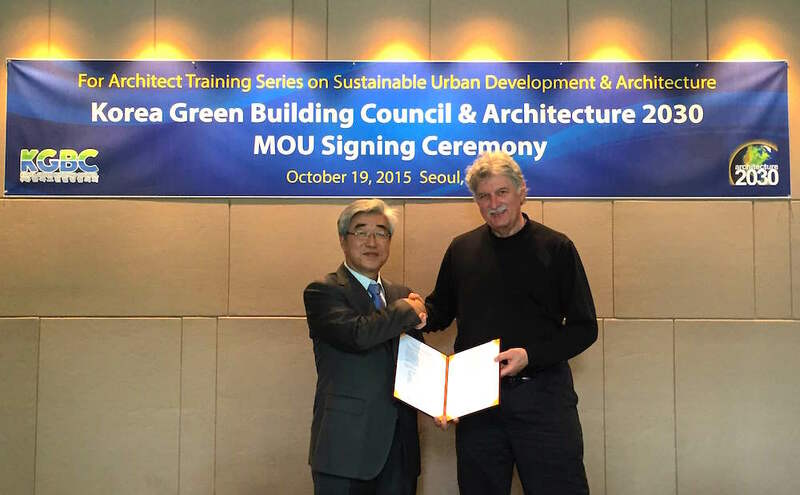 In order to support Korean architects and other building professionals to pursue lower and zero-carbon designs, Architecture 2030 and the Korea Green Building Council yesterday signed a Memorandum of Understanding yesterday to develop the Korea 2030 professional education series. The series builds on the success and experience of the AIA+2030 Series that has been offered to over 30% of the American Institute of Architects’ membership in 25 markets throughout the United States and is now being produced in an online version. “We are excited about this partnership. South Korea will be the first country in Asia to launch a 2030 Series. The series will provide not just design strategies but practical, actionable tools and methodologies that directly impact building design and performance,” said Mazria, who is set to hold a private meeting with Seoul Mayor Park Won Soon tomorrow. “There are many low-cost and no-cost design strategies that can increase a buildings’ performance and reduce its energy consumption and carbon emissions. Moving to zero does not need to be expensive,” he said. This event and announcement come as countries, regions, cities, communities, businesses and civil society all ramp up their commitments and actions to tackle climate change before the United Nations Framework Convention on Climate Change (UNFCCC) meeting in Paris in December.